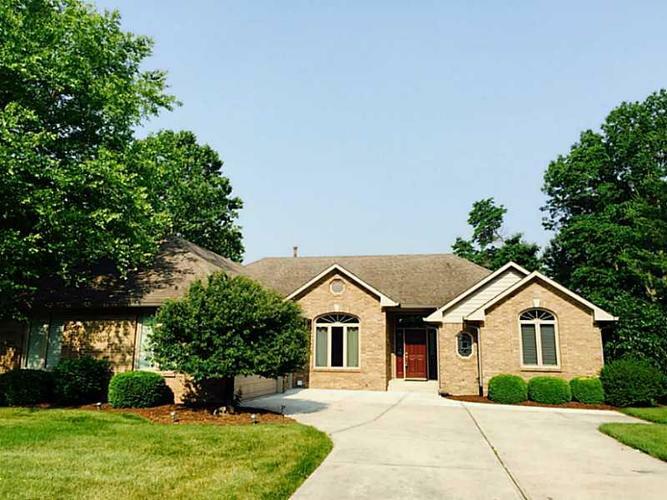 Spacious lakefront all brick custom built home. Gorgeous views from the multi level deck overlooking the lake! Kitchen has eat in breakfast nook and bar. Luxurious master suite with new custom walk in shower, beautiful tile and a huge walk in closet. Finished basement with a wonderful wet bar, large rec room with theater system. Perfect home for gatherings, entertaining or quiet nights by the fire enjoying the solitude. Lots of storage, even room to drive in mowers and golf carts in basement!! Directions:SR 37 TO OLD SR 37 (MARATHON STATION) AND GO WEST. FOLLOW TO MAPLE TURN RD AND TURN RIGHT. FOLLOW PAST GOLF CLUB AND TURN LEFT ON COUNTRY CLUB. TAKE 3RD LEFT TO 'T', TURN RIGHT. HOUSE IS ON THE LEFT.